Crops are a staple product on your farm. 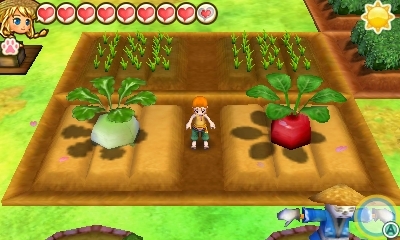 You'll be expected to grow certain crops to help the towns break their Town Link Ranks. You'll need to grow crops if you want to participate in the Harvest Festival every season. Crops are also used for cooking and even given to the Wild Animals to raise their friendship. You'll be given a set of tools by Uncle Frank to help you grow your seeds into harvestable plants. On your farm you'll have several Field Farm Circles (FCs); you can re-arrange these fields after Ludus installs your Fun Time Work Bench. To plant seeds, simply use your Hoe to till the soil, then equip the seeds from your bag and press the A button to plant. Each field can be plowed into two crop plots. Seeds can be purchased from the shops in the towns. Most seeds can only be grown during the season you are currently in, but there are some that will grow in any season. You cannot pre-seed your crops to get a jump start on the next season, and the seasonal crops will die when the first day of the next season comes along. Next you need to water the seeds every day. Take your watering can and fill it up at the water spout on your farm, then walk over to your crops and press the A button to water them. You will need to hold down the A Button to ensure that the crops are fully watered; your farmer will automatically stop watering once the crops have enough water. If you notice your crops have turned gray colored it just means you didn't water them the previous day. Simply give them water that day and they'll be back to normal the next day. Forgetting to water a crop will impact its Juicy quality, and if left unwatered for 7 days the plant will die. You can water your crops twice per day to speed up the time it takes for the plants to mature. 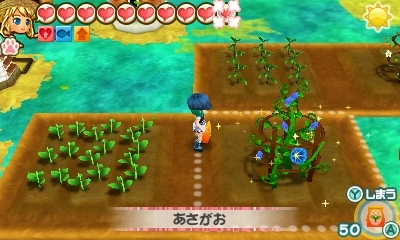 Another method to speed up crop growth is to swap out your Field FCs with Soft Field FCs, which become available at Ludus' shop once Tsuyukusa reaches Town Link Rank C. For example, a Pink Carnation grown on a regular Field and watered once per day will take 8 days to mature, but the same flower grown on a Soft Field and watered twice per day will only take 4 days to mature. On rainy days your crops will be watered automatically, but it only gives you one watering that day instead of two waterings. Winter season snow will not water your crops. If watering the plant doesn't turn its soil a darker color, then the crop is ready to be harvested; the game won't allow you to apply water to mature plants. A harvested crop will have four individual qualities: Color, Sweet (for crops) or Aroma (for flowers), Juicy, and Size. These four qualities will determine the crop's overall Star Rank. The higher the qualities, the higher the Star Rank. Increasing the Star Rank of your crops will help you win various festivals like the seasonal Harvest Festival and the bi-annual Cooking Exhibition. 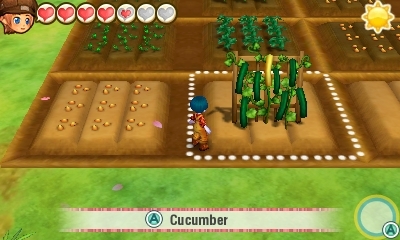 To increase your Star Rank you will need to utilize the Seed Maker Farm Circle and fertilizer. The Seed Maker can be crafted by Ludus after you have completed Farming Tips 1. You will need to bring him 20,000 G, 20 Lumber, 10 Small Lumber, 10 Glittering Stone, 3 Topaz, and 2 Ruby. The stone and gems can be found while excavating the mine nodes in North Westown. 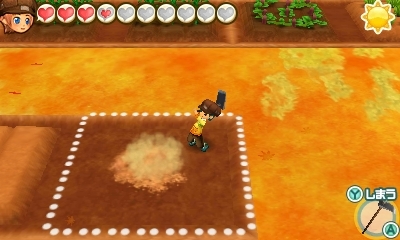 Basic quality fertilizers can be purchased from Miranda at her General Store or from Hinata at Ra Man's general goods. 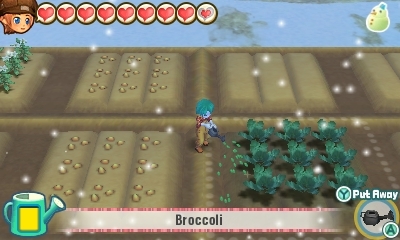 At the beginning if the game you'll only find Sparkly Fertilizer, but more types appear in their store inventory after you have won a Harvest Festival. Super Fertilizer will be for sale after all three towns are Town Link Rank A or higher. Propagating Fertilizer will increase the number of crops you harvest, but it also decreases a crop's Size quality if applicable (not every crop has Size). Propagating Fertilizer cannot be used on Mushrooms. Applying fertilizer can be done once per day by selecting it from your tool quick menu (the right-shoulder button) and then pressing the A button when standing on the crop you want to fertilizer. You won't see the increase in crop quality or Star Rank until you harvest the crop, and you can't apply fertilizer to crops that are full grown and ready to be picked. If the crop is at max level for the quality you're trying to effect or the crop is harvestable, you'll receive a "This doesn't need any more fertilizer" message. After harvest, put the crop into the Seed Maker to convert it back into seeds. Then you start the process over again: plant the crop, add fertilizer, harvest, convert to seed, plant the crop, and so on. For crops that regrow and can be harvested throughout the season (Tomato, Broccoli, etc. ), you can continue to add fertilizer to the same plant to increase the qualities at each harvest. Star Rank and the four qualities CAN decrease if the plants are damaged by a bad-weather storm. A crop will die and a tree will be reduced to a stump when the plant's qualities are 0%. You can double-up on your fertilizing efforts if you build the Liquid Fertilizer Maker Farm Circle. This object is at Ludus' shop after you finish Farming Tips 2. It requires 10,000 G, 20 Glass Stone, 20 Copper, 15 Gold, 5 Moonstone, and 1 Orichalcum. The Liquid Fertilizer Maker will craft water that enhance crop qualities. Just use the maker to create liquid fertilizer, fill up your empty watering can (equip the can and press A in front of the Liquid Fertilizer Maker), and then sprinkle the wet fertilizer onto your crops. Liquid fertilizer will increase the crop qualities by 3%. When using both bagged fertilizer AND liquid fertilizer, use the bagged fertilizer first and then apply the liquid fertilizer. You'll get the benefits of both fertilizers when applied in this order. The game will prevent you from applying bagged fertilizer if you placed liquid fertilizer down first. Remember, bag -> liquid and NOT liquid -> bag. Liquid Fertilizer only has an affect on your crops once per day, just like you can only use bagged fertilizer once per day. If you plan on watering your crops twice per day, you can use two watering cans - one with the liquid fertilizer and one with normal water - to conserve your liquid fertilizer for another day. Another option is to construct the Fertilizer Factory Farm Circle to produce Mega Fertilizer. The Fertilizer Factory is at Ludus' after you finish Farming Tips 1. It costs 20,000 G, 15 Brown Cloth, 10 Iron, and 5 Blue Cloth. You can use this machine to make the basic fertilizers, but it is much faster to simply buy these from the shops. This FC is best reserved for making the mega fertilizers, which will increase their respective crop qualities by 6%. Mega Propagating Fertilizer will increase the harvest quantity by 2. The Fertilizer Factory doesn't produce Mega Super Fertilizer. To make the base-level fertilizers in the Fertilizer Factory, the ingredients required for many of the fertilizer recipes are listed as "☆ Fertilizer." The materials the Farm Circle is requesting are ingredients to make the fertilizer and not the fertilizer you buy from Miranda or Hinata. The materials that satisfy the "☆ Fertilizer" ingredient are Twig, Branch, Black Branch, Weeds, and Fish Bone. Some crops can become giant sized or gold colored. These crops will sell for more money, can help ensure a victory during the Harvest Festival, and using giant crops as ingredients when cooking will result in more cooked dishes. Gold crops have a chance to appear based on a crop's Sweet quality, your Vine Grower trophy rank, and the plant has full harvest. Giant crops can appear from field crops and fruit trees, but gold crops only come from six vine plants: Cucumber, Melon, Pumpkin, Tomato, Watermelon, and Yam. For these vine crops, you need to wait until the vine produces its maximum quantity of crops before you attempt to harvest. These six plants can also produce giant-sized golden crops! For gold crops, once the vine plant reaches a minimum of 10% in Sweet quality it has a chance of producing gold varieties. The Sweet combined with your current Vine Grower trophy rank determines if a gold crop appears. For example, if you have the Beginner Vine Grower trophy and a Tomato plant with 52% Sweet, there is a 15% chance the plant will produce a gold Tomato at harvest. You'll increase your Vine Grower trophy rank by harvesting vine crops. The Master level is achieved once you have harvested a total of 1200 vine crop. Tree leaves, Flax, Cotton, mushrooms, paddy crops, and flowers cannot become giant or gold.